Bridge2Aid trains local Health Workers who are already established and well respected members of rural communities, and provides them with the skills, equipment and resources that they will need to provide emergency dental care. 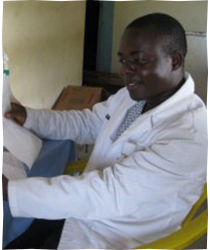 Daniel was trained on the November 2012 training programme in Geita district. daniel masesaHe had been working as a Health Worker from his rural dispensary for 9 years and had previously had no dental training. Before he was trained in emergency dental care, he had little choice other than to either refer dental patients to the district hospital or simply give them antibiotics or painkillers. To get to the district hospital-the nearest dental facilities, patients would have to take a 1 hr 30 minute local bus ride – a trip which the majority would struggle to afford, let alone be able to afford treatment once there. Invariably many patients do not end up making the journey and just suffer with the pain. He received a non-electric steriliser (pressure cooker) and basic instrument kit on completion of his training which allowed him to take his new skills back to his dispensary and treat his own patients, taking them out of dental pain – no longer having to refer them to the district hospital. At Bridge2Aid, supervision and monitoring forms a large part of what we do. Once a Health Worker is trained, the District Dental Officer takes on the supervision of their clinical skills and Bridge2Aid ensure skill levels are maintained by monitoring their patient numbers. Just 3 months following his training, already Daniel had seen an average of 7 patients per month, the majority he treated using extractions. At 6 months following his training, it was obvious that word had got around the village that Daniel was now able to safely and competently take people out of pain; he was seeing an average of 17 patients a month. One year on, Daniel is treating an average of 27 patients a month where he carrying out extractions on 86% of patient cases. This has dramatically reduced the amount of referrals to the district which will help ease pressure on his district hospital based colleagues. 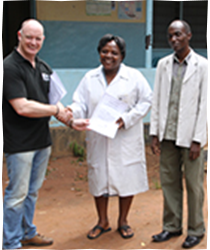 The District Dental Officer who works in the district hospital estimates that he has experienced a 44% decrease in the number of dental patients as a result of Clinical Officers, like Daniel now having been trained up in the rural areas in his district. Adelina, a Health Worker for 2.5 years, provides a health service for her community of over 10,000 people in Nyaadelinakabo, Tanzania. Adelina took part in our training programme in November 2012 and was happy to contribute to our Monitoring and Evaluation programme, allowing us to generate information relating to her work post training. Having previously referred many patients with toothache, Adelina was thrilled to participate in the dental training programme. Since successfully completing the training, Adelina has treated over 60 patients suffering with dental pain and safely carried out 43 extractions without the need to refer any patients.